Would you rather rescue Dallas Cowboys quarterback Tony Romo from a burning building, or save half a sandwich for the long ride home? Well, that probably depends on what kind of season Tony's having … and, frankly, on just how much you like your ham on rye. Three silly spots breaking today contrast the "two potential YOUs this football season." In each case, Cable You is uncool and makes wimpy choices. On the other hand, DirecTV You is super coolsville and makes all the right moves. They look a lot like those Budweiser pups, don't they? "The quarterbacks really get into the concepts we come up with and become very involved in the process," Valerie Vargas, AT&T vp, advertising and marketing communications, tells AdFreak. 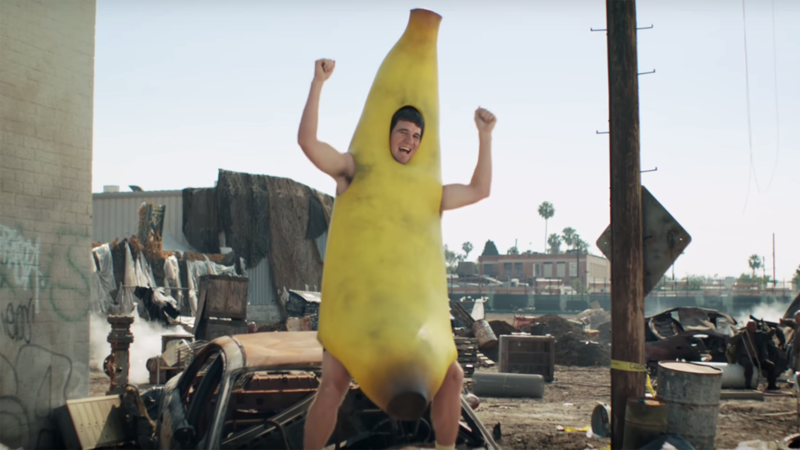 "Eli was such a fan of the banana costume, it looks like he will be wearing it again for Halloween," Vargas says. "(And) Tony was hilarious when selecting his costume, as he really wanted to adhere to a 1980's Miami Vice aesthetic."